Habit: Annual 1--10(15) dm. Stem: +- erect. Leaf: mostly cauline, proximal opposite, most alternate, +- sessile; blade narrowly elliptic to linear or proximal oblanceolate to spoon-shaped, entire or proximal sometimes toothed, coarse-, soft-, or silky-hairy or strigose, all or distal sometimes also stalked-glandular. 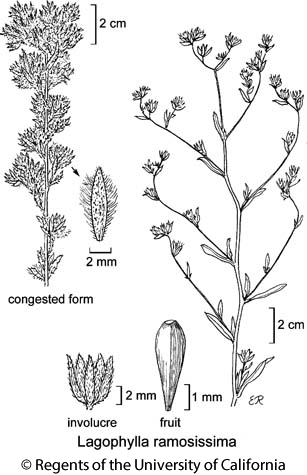 Inflorescence: heads radiate, in tight groups or +- panicle-like clusters; involucre 3--6+ mm diam, +- hemispheric or obovoid to obconic, sometimes subtended by calyx-like set of bracts; phyllaries 5 in 1 series, linear to oblanceolate, each wholly enveloping a subtended ray ovary, spreading and falling with fruit, on angles coarsely long-straight-hairy to minutely coarse-hairy or scabrous; receptacle flat to convex, densely bristly; paleae in ring between ray and disk flowers, fused or free, scarious. Ray Flower: 5; corolla yellow, ray fan-shaped, deeply lobed, abaxially often red- to purple-veined. Disk Flower: 6, staminate; corolla yellow, tube < throat, lobes deltate; anthers +- dark purple, tips triangular-ovate to +- rounded; style glabrous proximal to undivided, awl-shaped, short-hairy tip. Fruit: ray fruit +- compressed front-to-back, glabrous, black, tip beakless, pappus 0; disk fruit 0, pappus 0. Species In Genus: 5 species: California, to Washington, Montana, Nevada. Etymology: (Greek: hare leaf, for soft-hairy leaves) Note: Easily overlooked; leaves wither early, heads close at mid-day. Lagophylla diabolensis newly described, added as native. Habit: Plant 1--10(15) dm; self-compatible. Stem: glandless; main axis obvious or not (+- zigzag). Leaf: +- gray, most glandless, distal stalked-glandular abaxially, glands generally +- white or yellow, sometimes golden-brown. Inflorescence: heads tightly grouped or in open, panicle-like clusters; calyx-like bracts subtending involucre 2--5; involucre obconic to obovoid; phyllaries 4--7 mm, on angles coarsely long-spreading-hairy, hairs +- widely spreading to curved toward phyllary tip, 0.5--1+ mm. Ray Flower: ray 3--6 mm. Fruit: dull to +- shiny, weakly striate. Chromosomes: 2n=14. Citation for this treatment: Bruce G. Baldwin 2014, Lagophylla ramosissima, in Jepson Flora Project (eds.) Jepson eFlora, Revision 2, http://ucjeps.berkeley.edu/eflora/eflora_display.php?tid=3719, accessed on April 20, 2019. CA-FP (exc NCo, ChI, SnJt), MP; Markers link to CCH specimen records. Yellow markers indicate records that may provide evidence for eFlora range revision or may have georeferencing or identification issues. Purple markers indicate specimens collected from a garden, greenhouse, or other non-wild location.